Are you a Seminoles fan looking for new show to watch? Showtime may be able to perfectly suit your needs. This year the Showtime original series, A Season With, will feature Coach Jimbo Fisher and his Florida State Seminoles. The show’s previous season followed Notre Dame and has now made its way to the sunshine state for the 2016 season. A Season With Florida State Football or (A Season With for short) gives a behind the scenes perspective of the Seminoles from the classroom to the gridiron. The show follows the Seminoles week by week depicting the preparation and hard work of players and coaches leading up to every game. Locker room speeches from Jameis Winston and sideline conversations between players and coaches put viewers in the midst of the action. Providing in-depth scenes of practice and preparation for coaches and players is only one aspect of the show. 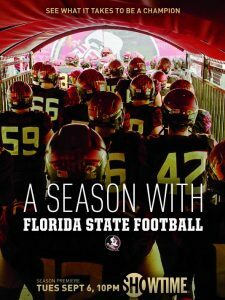 A Season With also focuses on the personal lives of everyone involved with Florida State football. The first episode tells of the would-be starting quarterback, Sean Maguire and his broken foot. As a redshirt senior, Maguire’s time to take charge was finally here until his injury put him behind Francois. A Season With gives viewers a personal perspective that allows them to gain a deeper sense of what college athletes overcome and how they handle adversity. Aside from football, the show includes what players and coaches are doing off the field. Florida State wide receiver, Travis Rudolph, is followed by Showtime to a local Tallahassee school to have lunch with an Autistic child named Bo. Rudolph and Bo quickly hit it off in the first episode and become even closer friends as the weeks go on. The difference players are making in the community is not normally a high priority for sports broadcasters, but Showtime has created an outlet for viewers to see what an impact FSU and other featured college football programs have off the field. A Season With covers almost every aspect of the Seminole’s football program. From overcoming adversity to making a difference in a child’s life, this show is definitely a worthwhile watch. New episodes A Season with can be seen on Showtime every Tuesday at 10 p.m. ET and previous episodes can be seen online.